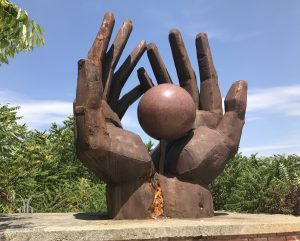 On my trip to Hungary this summer, I visited an outdoor garden museum called Memento Park in Budapest. After the fall of the Soviet Union, Hungary reclaimed their squares and parks by removing all the Russian-installed monuments proclaiming how wonderful it was that the Russians were in Hungary. A little side note that I learned was that some Hungarian artists who where commissioned to create various statues or works of art to pay tribute to the occupying Russians resisted. They created poorly-designed works: the proportions were wrong, a nose was too big, the results were not acceptable. Those works never got displayed. I would love to see a museum off those pieces! What a brilliant way to preserve the history of a time that the Hungarians didn’t want to return to. They didn’t destroy the statues. They didn’t sweep it all under a rug as if it never happened. 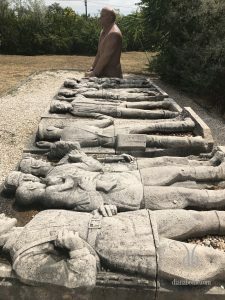 Then they replaced many of those pieces with new statues to represent their freedom or to pay tribute to historical figures in the country’s long history. I grew up during the last part of the Cold War. This park was fascinating to me, because of the way the two sides were presented to the other. 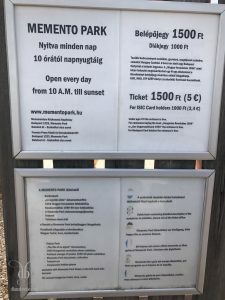 My traveling partner was in high school the same time I was, but his experience was very different in communist Hungary. They were told the West was a horrible place and they would never want to be like those people, just as we were told the same thing about the Soviet Union. No amount of propaganda displayed on those statues could keep people from wanting to have good, successful, fulfilling lives. The Hungarian government didn’t throw away statues and plaques that the Soviet Union imposed on them. Memento Park is a reminder not to return to that kind of mindset. Don’t just remove the history. Move it. Remember it. Teach it. Don’t repeat it.